Who's Behind the UFO Phenomenon? 3) That the key to the mystery of the UFO's is to be found in Christian demonology. 5) Finally, based upon this analysis we shall attempt to forecast for the future, more or less near, the unfolding of the mystery of iniquity. It is point three that is addressed in the following chapter of Kerizo's book, "Angels and Demons—Miracles and Prodigies." The key to understanding the UFO's is to understand who in the world is capable of producing them. Good or Bad, Who Are the Angels? Albert Einstein, asked shortly before his death what he thought about the origin of UFO's, said: "The UFO's are piloted by men who left the earth ten thousand years ago." Plainly, they are a link in the revelation and the accreditation of the New Religion, the religion of Man. It is necessary to bear in mind, however, that, in the creation narrative, Sacred Scripture only speaks to us of two kinds of intellectual natures: the angelic and the human. There are no others. The angels are purely spiritual beings whose intellectual and volitional activity is not hampered by a body, nor subordinated in its exercise to organs or to the power of emotions, as is the human soul, which is the form of the body and composes with it a being whose spiritual activity can only be exercised by means of a body. This state of human intelligence is an inferior state which places man on the last rung of the scale of intelligences. "Nothing is in the understanding that is not first in the senses," runs the Scholastic adage. St. Paul expresses the same truth when he says: "For the invisible things of him from the creation of the world are clearly seen, being understood by the things that are made" (Rom. 1:20). As for the angel, he is endowed with a nature more perfect than ours. He has no need of sensible things to raise himself to the perception of intellectual truths. He is an admirable likeness of the Divinity, and it suffices for him to contemplate his own being and nature in order to attain to the knowledge of God and of His divine attributes. The understanding's mode of apprehension still occurs by means of representation. But while for man, it is the exterior and material creatures that serve as a mirror [because nothing is in the intellect unless first in the senses.—Ed. ], for the angel, it is his own intelligible nature. Nevertheless, although he is a pure spirit, the angel lacks the power to attain to the knowledge of God directly and without intermediary, face to face. What makes all the difference between the good angels and the bad, or demons, is that the good angels, by their submission and now elevation in glory, have access to truths and splendors of the supernatural order and of the beatific vision of God, whereas the bad angels, by their pride, are deprived of them, while conserving, because of their angelic nature, the understanding of truths of the natural order. and by many modern churchmen. 1) They sometimes show themselves to be very aggressive, wounding or even killing human beings or destroying equipment. 2) Sometimes they kidnap men. 3) In this case, they abuse them and remove from them some blood or a patch of skin. 4) They hypnotize people and communicate with them by telepathy. 5) Faced with a categoric refusal to communicate, they disappear. 6) In some cases, the illnesses of those who have been in contact with the extraterrestrials have disappeared. 7) Confronted by them, the human being experiences a sentiment of despair and of fear. 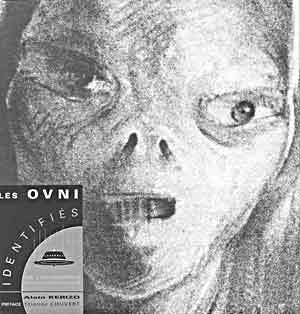 8) The external appearance of the extraterrestrials varies. They can appear as dwarves or as giants, as men or women, or even as monsters. 9) Their apparitions are often accompanied by light effects. 10) They appear and disappear instantaneously. 1) Man's enemy, the devil, breaks down the monks' cells and destroys their material possessions. He beats and wounds saints and hermits. 2) The Sacred Scriptures mention cases of hermits being kidnapped by the devil. 3) He often appears under the guise of a woman or a man in order to take advantage of the situation. 4) He tries to make his thoughts penetrate the hermit's mind. 5) As soon as he meets with a categoric refusal by a man, or at a prayer, he disappears. 6) The Holy Scriptures mention that magical practices can cure certain illnesses of men, but at the price of the sufferer's losing all hope of everlasting life. 7) The apparition of the devil causes a feeling of unease and of fear (see especially the life of St. Antony). 8) He appears under various forms, whether human, animal or monster (see the life of St. Antony and of St. Brechnikov). 9) He is a lightbearer. 10) He disappears suddenly if presented with a crucifix or if sprinkled with holy water. If it is true that God created all things without intermediary, by direct action, and that He also intervenes in the conservation of all that exists, it is no less certain that God has instituted amongst His creatures an order, a hierarchy. Thus, certain inferior creatures, in their conservation and in their action, depend on superior creatures, which are themselves incapable of subsisting without God's action, but which can nevertheless cooperate in the activity of maintaining in existence and in the development of other creatures. Given the elevation of the pure spirits and of their relative nearness to the First Cause, it is not surprising that they play an extensive role in the divine government of material creatures and of those composed of spirit and matter, men. This doctrine rejoins that of the ancient philosophers, Aristotle in particular, who did not hesitate to attribute to superior motions, such as the planets or sun in the signs of the zodiac, a considerable influence on the vital phenomena of generation and conception. It rejoins—and with reason (for we know henceforth the nature of Those who have taught them)—the hypotheses of occultists, astrologers, and other magicians who accord to the stars moved by such intelligences, and to disembodied spirits, an extensive power over terrestrial elements and even human beings. It is not surprising, then, that the exposé that St. Thomas Aquinas makes on this subject brings a solution to the problem posed by the UFO's. We shall set forth Catholic doctrine relative to the power of the angels over creation under three aspects: 1) corporeal creatures; 2) man; 3) human societies. We shall see that Catholic doctrine answers and explains all the cases of UFO's, which we shall henceforth qualify as "diabolic infestations," in conformity to the terminology used by theology. It is written: "In the beginning God created heaven, and earth." By "heaven," according to St. Augustine commenting on this verse, is meant primordial angelic nature, and by "earth" primordial corporeal nature. Created pure spirits, at the pinnacle of the pyramid of created being, they dominate in some way the universe, material, visible, and invisible; they preside over its government and conservation. They are the active agents of divine Providence. By virtue of this office, they have a perfect knowledge of the material order of created things and of the laws that preside over its development. They make use of it in order to fulfill the mission of general government and to fulfill particular missions of assistance to men, as the Bible shows in many examples. One sees them in the Old Testament take the natural form of the human body to appear to Abraham and the prophets, or conduct the Hebrew people out of Egypt; and in the New Testament in order to announce to the Blessed Virgin that she has been chosen to bring forth the Savior. Finally, in both Testaments, one sees them work miracles by the divine power. This is true of the good angels, but in the beginning, the demons made up part of the angelic Powers who governed the corporeal order. They, too, belonged to the nine choirs of angels who were commissioned to direct the universe. Among the nine choirs, there is one, the Virtues, specially appointed to the working of miracles. Chased from the empyrean heaven since their disobedience, the demons were cast into hell. Nevertheless, they will not be relegated there definitively until the Judgment Day. Until then, they exercise their art, so to speak, on visible creation, within the limit allowed by God. But since man constitutes the king and summit of this creation, it is therefore by man that they are led to attack God. As the primordial angelic nature was made light, that is to say, converted to the Word who is light, after a trial destined to test his submission, so the demon served unconsciously to try the fidelity of man towards his Creator. Had he triumphed in this trial, man would have been like the good angels, converted to the light. Following man's disobedience, Satan was able to put on the insignia of his new kingdom, and become "the prince of this world," the title which our Lord recognized to him in the Gospel. Let us underline this fundamental point. If man had not sinned by disobeying, Satan would not have been able to do more. He would never have been able to infiltrate the government of the created universe. His judgment would have been definitively pronounced. He would have been relegated to hell for eternity and we would never again have been tempted. It was by his sin that man and all that depended on him was arrayed under his banner, and Satan, until the coming of Christ, was able to thwart the effects of the divine government of the world exercised by the ministry of the good angels, except, however, the people of God. We have indicated the consequences of this government, the immense catastrophes and the bloody disorders that it provoked. In these latter days more than ever, creation is subject to the assaults and power of the devil. And the devil spreads ugliness and unhappiness everywhere, by the intermediary of men who are enslaved to him. He intervenes directly by his manifestations (among which are the UFO's); by disasters of all kinds; by earthquakes, which some say often coincide with the sightings of UFO's; by the disturbances that he introduces in the regular course of the seasons and the growing cycle; by the desertification of the lands that are subject to his reign; by the perturbations that he provokes in space-time; by his prodigies of all kinds; and finally, by possession, often unbeknownst to the victims, of the minds of men. The power of angels over the material universe perfectly explains the phenomena associated with UFO's: the sudden apparition and disappearance of craft, with or without the presence of beings resembling humans. All these characteristics justify the classification of the UFO phenomenon as demonic infestations. One can readily explain their movements at incredible speed and their sudden disappearance by the fact that the demons are not subject, as are men, to the continuum of space and time. Their vessels seem to fall into another dimension, into another universe, that of spirit. This corresponds equally with the thesis of certain philosophers who admit the existence of angelic time, intermediary between divine eternity and human time. Over and beyond the difference between angelic time and the human time, other faculties reserved to the angels explain the phenomenon of UFO's: the ability of pure spirits to materialize and dematerialize at will, that is to say, to borrow the forms or appearances of material creation, human or animal. The serpent of Genesis, the dragons of the ancients, the human body: all these forms, more or less caricatured, have been borrowed by "the prince of this world" in the course of human history. What is noteworthy is the adaptation of the forms used to the changing mentality of men throughout history. In Antiquity, the form of the dragon was preferred because of its terrifying aspect, proper to inspire submission. In these times of the reign of technology and science, what could be more appropriate or refined, more "pregnant" and suggestive than the form of the cosmonaut, archetype of the man of civilizations who believe themselves to be or who desire to be superior; in a word, what could be more apt to seduce "modern man"? They are the brothers of magic. Also, those who, by recourse to occult practices, commit evil actions, venerate them, especially their chief. They have an abundance of varied and false images of things, and by that means they are eminently skillful at putting into play secret means for organizing deceits. ...Satan is always the same. The stage is the same, the actors are also the same, only the props have changed! If angels or demons can make use of the plasticity of prime matter, they cannot, on the other hand, influence the substantial form. That power belongs to God. In other words, demons can accomplish prodigies, but they cannot work miracles. For example the transformation of a stone into a frog would constitute a miracle. There is a miracle strictly speaking when something is produced outside the order of nature. But for there to be a miracle it is not enough that something be accomplished outside the nature of a particular creature: for then, when someone throws a stone into the air he would work a miracle, since that is outside the nature of the stone. Thus a thing is a miracle if it occurs outside of the order of created nature. For only God can do that: whatever is accomplished by an angel or any other creature by its own power is accomplished according to the order of created nature: it is not a miracle. Because we do not totally know the power of created nature, when something occurs outside the order of nature, it appears to our eyes as a miracle. But when the demons accomplish something by virtue of their nature, we also call it a miracle, not absolutely speaking, but in relation to us. It is in this manner that the magi work "miracles" with the help of "demons." He cites the case of the Pharaoh's magicians who, by the power of demons, "produced real snakes and real frogs." To explain these prodigies that look like miracles, St. Thomas formulates several possible explanations. The first depends on the demon's power of suggestion over the human mind. The second stems from the demon's power over nature to fabricate a body and to take the appearance of man or animal. Finally, to explain the apparition of living beings, St. Thomas attributes to the demons a perfect knowledge of the laws of life. He puts forth the hypothesis of the existence in a latent state, in prime matter, "vital seeds" capable of engendering life under certain exceptional circumstances. The demons, more intelligent than we, would know these conditions. Recall that science, having discarded the hypothesis of spontaneous generation at the end of the 19th century, seems to be having recourse to it in our time. Let us not go further into this hypothesis,6 which does not directly concern our subject. Let us consider, rather the usefulness of the distinction between a supernatural event (miracle) and a preternatural event (prodigy) as it applies in the study of UFO's. A miracle can only have as author God, Creator of all things, or else the angels to whom He has given the power to work miracles. A prodigy can only have as author the devil mastering the cosmic forces by means of a science of which we are ignorant....The true faith was proven by miracles. It is by prodigies that the religion of the devil will be insinuated into the minds of men. The devil likes to ape the Creator. He is storing up for us in future a cortege of stupefying prodigies which, according to Holy Scripture, would confound even the Elect in those days were they not preserved by a special grace! It is legitimate to enquire whether the prodigies realized in our times—the UFO's, for example—might not be the work of men initiated into the devil's science by the devil himself. Just as the Creator uses the ministry of angels to perform miracles, as Scripture and tradition teach, so the demons could avail themselves of the ministry of certain men in order to accomplish their prodigies. History testifies to this supposition unequivocally. Recall the Pharaoh's magic at the time of Moses. Certain experiments conducted in the United States about 40 years ago could lead us to accept this hypothesis as true for our era, too. The most astonishing of the "paranormal" experiments was conducted by the U.S. Navy in 1943 in Philadelphia and at sea. The experiment's purpose was to record the effect of a strong magnetic current on a manned surface vessel. The results proved to be stupefying. The ship and its crew became invisible. The men experienced a strange sensation of dematerialization. One sees to what aberrations the use of a certain science can lead. Christ did not come in order to unveil for our use the laws of the universe, but rather truths of the supernatural order. Not that the doors of science must be systematically closed, but that men, in the state of sin, cannot cross the threshold without danger, and if they go too far, it is certainly not in accord with the divine will. "Science without conscience is the soul's ruin," wrote Montaigne. Then, if it is not the Creator who arouses such curiosity, it can only be His enemy, the Serpent of Genesis. The power that the devil possesses over man...provides a supplementary confirmation. Taking these considerations into account, we cannot exclude a priori a direct intervention of men in producing the UFO phenomenon....Nevertheless, such an intervention could not occur without an indirect action of the devil, as we have just seen....In the end times, Satan will put everything into play in order to "ape" God in His miracles and set himself against Him, going so far as to produce false resurrections of persons from the past. These false resurrections...based on a technique of "prolonged astral bilocation," reserved to the damned, who are entirely deprived of liberty, were announced by the Blessed Virgin in her message at La Salette. Yes, Satan rules, but God keeps watch. The parallel that exists between miracle and prodigy also exists between prophecy and oracle. Can the devil know the future? The answer is found in making a distinction between the realities of the supernatural world and those of the created universe. Concerning the supernatural world, Lucifer's henchmen are like men: they only know what it has pleased God to reveal; with this difference, that, since the fall, the demons are plunged into complete blindness as regards spiritual realities. The import of this fundamental truth is that only God can exactly foresee future events and conduct human history, arena of man's free will, to its end. For, if that were not so, it would suppose that either human freedom does not exist, or that the devil can know ahead of time the choices that the men yet to be born will make. But the "secret of hearts" is known to God alone. The devil does not know and can never know how men will respond to the graces that are offered or will be offered by the Creator. On the other hand, as regards the created universe of which he perfectly knows the laws, he can certainly predict the consequences of certain phenomena. Knowing the causes, he can perceive the effects even in cases where the events are unforeseeable to man, who never knows completely the chain of causes and effects. The prediction of future events which depend upon free choices is the realm of what is called "prophecy"; the prediction of events determined by the interventions of the devil falls into the domain of oracle. The demons are not prophets, but only diviners, that is, what are called "oracles." If in the Old Testament God had His prophets, the devil had his oracles. Sometimes these diviners even predicted the opposite of what the demons wanted, as is shown by the story of Balaam. The reason for the reappearance of oracles would be that, by submitting himself once again to the power of the devil, man gives him a certain hold on the future, on his own future, reality henceforth coinciding with the disoccultation of the Luciferian Plan. Thus it is Lucifer's plan that, with God's permission and in a language that remains hermetic, the devil reveals to us. It is a sure bet that part of this plan has been accomplished in a world where he has succeeded in becoming master of causes by subjecting the minds and souls of men and human societies. That still does not make it prophecy, however. To close this topic, let us say a few words about the reasons for their apparent and forbidding obscurity. Prophecies and oracles are, in fact, ordinarily incomprehensible whatever their language or style. First of all, they are given for a time of which their contemporaries have no idea. Would we have been able to imagine the television in the 12th century? The representation of the television being impossible, the words to describe it would have been very obscure, not corresponding to any concrete object familiar to the minds of men living at the time. Moreover, as regards prophecy, God would annul our liberty were He to reveal to us too distinctly the future. Why should we change our lives if we cannot change our destiny! To use the current language, such an attitude on God's part would be demoralizing. But God, who created man free, totally respects man's liberty. St. Augustine said that God, who made us without our will, cannot save us without our participation. This is so true that all the end times messages of the Blessed Virgin Mary for the last 150 years are always conditional: "If you do not convert...if you do not amend your life...." She has never affirmed that no matter what we do, there would be wars. As for oracles, their obscurity results not only from the fact that Satan is the Ape of God, or that enigma is a source of fascination and seduction and foments in men the desire for power; it also results from the fact that he is not the master of free wills, and thus cannot exactly predict the future. Thus obscurity, double and triple meanings, constitute opportune screens. He cannot fail or be taken in a lie. It is simply a precaution on Lucifer's part. Besides, with the passage of time, it is clear that prophecy can never be perfectly understood until it has come to pass. We conclude by answering a question that is surely in the reader's mind. How can we men ever discern the true from the false, the miracle from prodigy, for want of knowing the secret of hearts and the laws of matter? The answer is to be found in traditional catechisms. We can discern the true from the false, the miracle from prodigy, by the gift of the discernment of spirits, which we receive in Confirmation. But the soul must be open to the reception of this gift. What is needed is a faith submissive to the teaching of the Catholic, Apostolic and Roman Church; a faith fortified by the reception of the sacraments and by perseverance in prayer and penance. But systematic doubt, "searching," as they say today, discussion of revealed truths accompanied by a worldly and dissipated life lead sooner or later to supernatural blindness and render the soul extremely vulnerable to the deceits of the devil. This is what the Blessed Virgin has reminded us in her messages at La Salette, Lourdes, and Fatima, to name just the best known, and, moreover, incontestably recognized by the Catholic Church. That is the only possible protection against the devil. There is no other. 1. Summa Theologica, I-I, Q. 50, A. 1. 3. ST, I-I, Q. 61, A. 3. 4. Bishop Gaume, Traité du Saint Esprit. 5. In "L'etat mystique" of Bishop Saudreau (Angers, 1921) one reads this very interesting remark: "It even seems that the devil is not allowed to perfectly reproduce the human form." He adds in a footnote: "We had learned from various sources this peculiarity before reading it in Suarez, who evokes the testimony of several authors and the avowals of witches. One day, a confrere was consulting us on suspicious apparitions; we advised him to find out about the shape of the feet: the seer looked. They were animal feet." This is not without interest when one considers attentively the accounts of "humanoids" piloting the UFO's! 6. Especially since a fourth, much simpler, hypothesis seems to us to be more likely: The devil could simply have transported the frogs that he had gathered up a few miles from there, in order to place them at the disposition of Pharaoh's magicians! Accounts of kidnappings by the UFO's are frequent. Who can do the greater deed can do the lesser. In the magicians' trade, only the end justifies the means adopted to make a deep impression. Such is the case of the notorious Filipino sorcerers who, operating with bare hands, extract from their patients' bodies divers objects (cotton, scissors, etc. ), which seduces the patients; but the objects must not come from very far: the operator's pocket, for example!